"The mouse has had a good run, but it's time to say good-bye," says John Underkoffler, the founder and chief scientist of Oblong Industries, Inc, whose flagship product is the gestural computing platform. 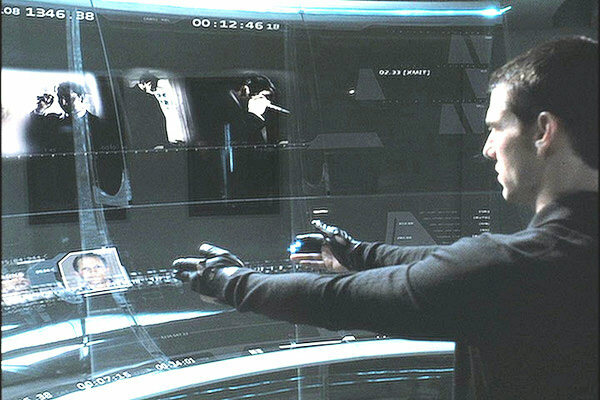 John Underkoffler, who has worked on human machine interfaces at MIT's Media Lab for over two decades, served as science and technology advisor to the MINORITY REPORT (2002), THE HULK (2003), and AEON FLUX (2005), among others. The typical setup uses a set of cameras and matching hardware that can track 3D positions. With the help of gloves, the system infers the user's hand and finger positions and orientations. These are finally parsed by Oblong's proprietary gesture recognition engine where they are interpreted. Oblong Industries plans to license its human gesture-based operating system to qualified development partners in various industries. In the meantime, an Oblong competitor GestureTek is already in commercial production. 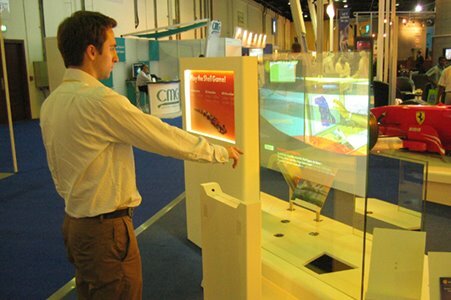 The company’s multi-patented video gesture control technology (VGC) lets users control multi-media content, access information, manipulate special effects, even immerse themselves in an interactive 3D virtual world – simply by moving their hands or body. They deliver Wii-like gesture-control without the need to wear, hold or touch anything. 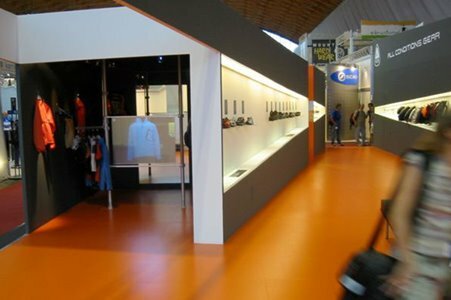 The technology is used in museums, science centers, amusement parks, trade shows, retail locations, bars & nightclubs, real estate presentation centers, corporate showrooms, boardrooms, digital signage networks and other public spaces such as airports and stadiums. They aspire to revolutionize television production, game development, advertising, virtual videoconferencing, and even the healthcare sector, by applying their technology in unique and innovative ways. 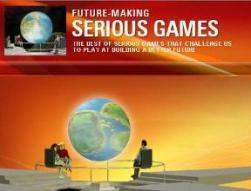 GestureTek was originally known as JesterTek and Vivid Group. GestPoint is the core gesture recognition technology powering GestureTek’s touchless interactive displays, point and click presentation systems and mouse replacement solutions. GestPoint utilizes advanced computer vision and body tracking software to convert simple hand movements into direct mouse control in any environment. 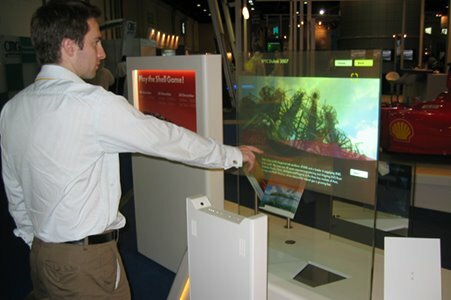 The AirPoint hand-tracking unit delivered point and control interactivity for Shell's tradeshow exhibits. Museum Boijmans Van Beuningen. 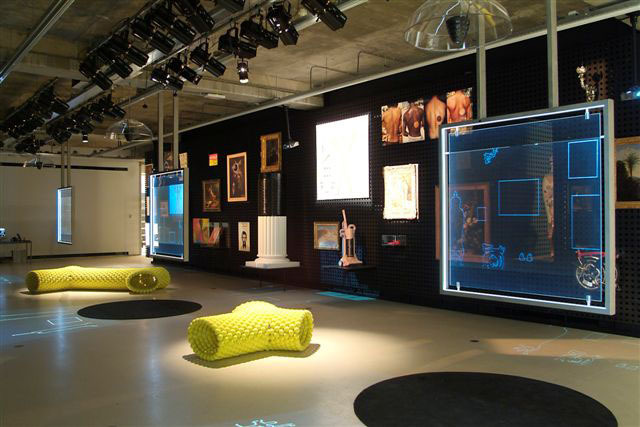 This exhibit involved the creation of a series of floating transparent "heads up display" screens that allowed visitors to the museum to get additional information on a number of physical artifacts mounted onto a wall in front of the screens. The visitor would simply point at an outline image of the artifact of interest and then be able to browse video, image, and text information on the artifact, its creator, other works, etc. 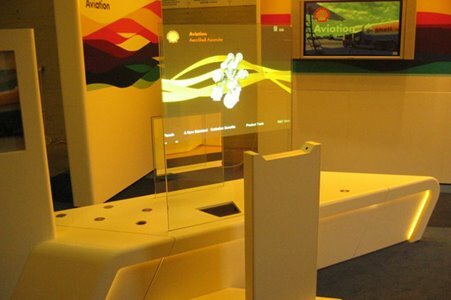 The exhibit combined custom content with holographic screens and ceiling mounted projectors, custom built "flat-lite" frames, audio cones, and GestPoint tracking systems. 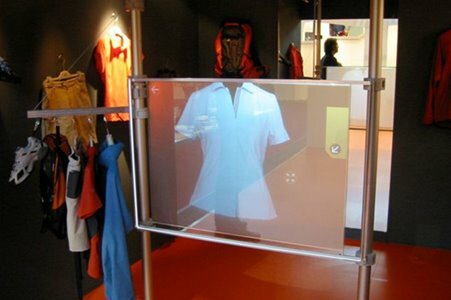 GestPoint technology created a stunning interactive retail experience for Nike's tradeshow visitors. Illuminate™ Multi-Touch Tables & Displays: Futuristic computing surfaces with no visible screens or hardware, used to navigate traditional multi-media or deliver multi-touch interactivity. ScreenXtreme™: An immersive signage solution that projects a user’s image onscreen and lets them manipulate multi-media content with hand and body movement. AirPoint™: A tiny unit that tracks finger position, enabling users to point to a screen from any distance to access menu-based presentations. AirPoint provides motion-sensing cursor control, eliminating the need for a mouse, keyboard or touchscreen to control interactive presentations. 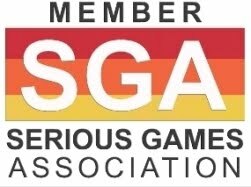 GestureXtreme®: A thrilling immersive gaming experience where users see themselves onscreen, interacting with virtual characters and objects. GestureFX®: An eye-catching visual display system that responds to body motion, projecting dynamic multi-media content onto floors, walls, tables, bars or counters.